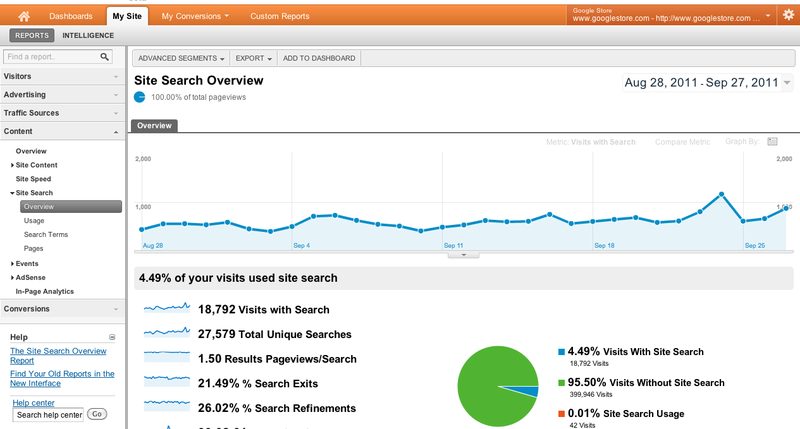 Google Analytics Site Search reports provide extensive data on how people search your site once they are already on it. You can see initial searches, refinements, search trends, which pages they searched from, where they ended up, and conversion correlation. In the past we admit that setup was a little challenging, but we’re happy to announce that now we’ve made it easy to setup Site Search tracking directly from your Custom Search Engine. If you are already a Google Analytics user (and your site has the Google Analytics tracking code on its pages), go to the Custom Search Engine management page, select your CSE’s control panel and click on Google Analytics from the left-hand menu. We’ll display a list of your Google Analytics web properties so you can select one and tell us the query and category parameters that you want to track. Once you save your changes, we’ll generate a new code snippet. Copy it from the Get Code page, paste it into your site and setup is complete! 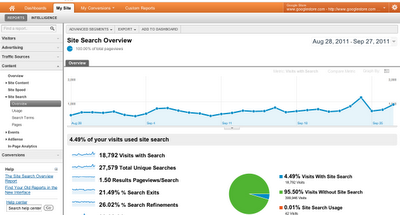 You can then access Site Search reports from the Content section of Google Analytics. Happy analyzing! If needed, you can find help with setup here and an explanation of the differences between Google Analytics and Custom Search statistics here. Let us know what you think in our discussion forum.